Apple rolled out new iPhones at a flashy event, but Amazon's low key consumer products could herald a new era of voice technology. Last week, Apple held one of their famous product launches complete with flashy video and pop music to reveal the company’s latest high-tech gadgetry: powerful new iPhones and an updated Apple Watch with FDA-approved heart monitor. On Thursday, Amazon held their own at which they launched a voice-controlled microwave. The two events showcased the sizable differences between the two tech giants, which recently became the first and second public U.S. companies to be valued at $1 trillion. Apple relies on its tech hardware sales for its core business, while Amazon is focused on the broader retail market. But microwaves aren’t going to change Amazon’s bottom line. At least not yet. Amazon announced more than 70 new devices, features and developer tools at Thursday’s event including a range of new devices that integrate the company’s Alexa voice assistant. The microwave, however, was the star of the show, garnering a range of reaction on social media, plenty of coverage in the tech press, and plenty of Google search traffic. Initial reactions to the product were reasonably positive. “First impression of Amazon’s Alexa-enabled microwave: it is a microwave,” tweeted Dieter Bohn, executive editor of digital tech publication The Verge, who reviewed the appliance. On the surface, Amazon might seem to be playing a far different game than Apple, but Andrew Lipsman, principal analyst at research firm eMarketer, said Amazon’s operating differently. “I sort of feel like Amazon is playing chess when everyone else is playing checkers when it comes to voice,” Lipsman said. Lipsman said that the microwave is part of Amazon’s broader strategy to be a leader in voice technology. 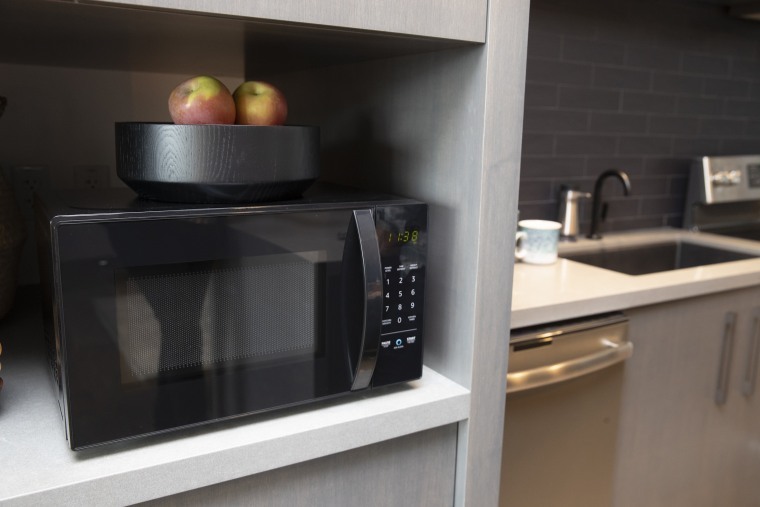 While it might seem trivial to get users to talk to their microwave, he noted that Amazon’s connected speaker offerings have already started to change how people interact with their devices. “You’re trying to create a new behavior among consumers, so what you need to do is start with the simpler use cases to habituate consumers,” Lipsman said. Amazon and Apple are competing directly when it comes to voice technology. Apple launched its assistant, Siri, in October 2011, kickstarting the era of modern voice technology. Just more than three years later, Amazon launched its Echo speaker, which had the first iteration of its Alexa assistant. Since then, the two companies have been leaders in voice technology, but Google has made significant strides as well. Amazon’s previous dominance of the connected speaker market has now given way to heated competition with Google. But Amazon’s goal isn’t to sell speakers, O’Shea said. The company wants to convert more people to its Amazon Prime membership, a bundle of offerings and services including original video and two-day shipping that costs $119 per year. The Amazon microwave, which costs $59.99, is a way to get Alexa into more homes and into the daily lives of people — who are then more likely to join Amazon Prime, O’Shea said. Signs of that strategy were littered throughout Amazon’s presentation. The company announced its first device to bring Alexa to cars, with a speaker that can sync to a customer’s smartphone and provide services like directions. It also launched a developer tool called Connect Kit, which opens the door to other companies building Alexa into their devices — potentially expanding Amazon’s reach without having to develop products themselves. Lipsman said he believes this is just the start of Amazon’s efforts to make Alexa into the future of computing, giving them an even more dominant grip on the growing e-commerce market.